Beautiful wedding dress made and designed by Jesus Peiro in Barcelona - original cost £1700.00 - the fabric is an absolutely gorgeous rich satin and it's a timeless, classic wedding dress with pockets; it has a full skirt with a Slit neck opening and deep V and buttoned back; lining is rich Jesus Peiro satin material which adds to the luxurious feel. Dress is on lighter side of Ivory. 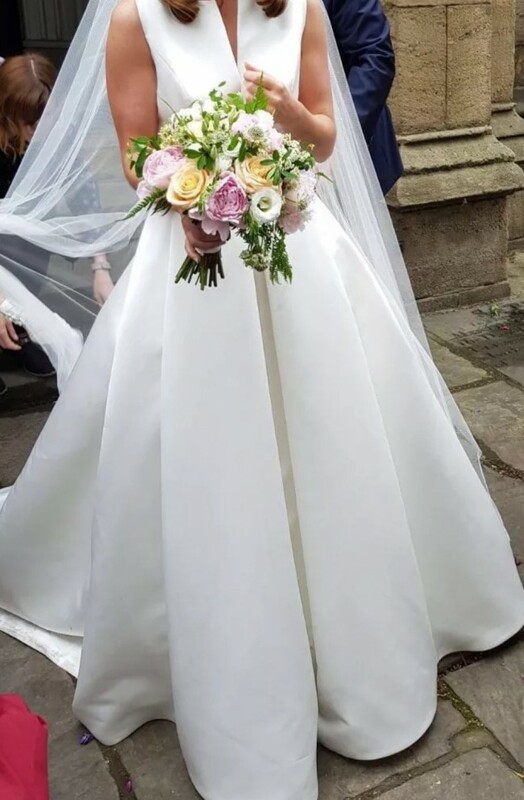 Full length narrow satin edged two-tier veil, cost £195.00 and worn once, also included in the sale - not one pictured. Dress label is 10 but it is a Size 8/10 owing to fact that is has been altered slightly around the waist and is in between an 8 than 10 around waist. Narrowest part of the waist now measures 33cm (one way) and it is about 67/68cms all around. For your information 65cm is UK 8 and 70cm is UK 10. Designers photos show models wearing dress with petticoat which gives fuller look; worn without petticoat allows beautiful folds to fall at front of dress - choice is yours. Enter Jesus Peiro 7014 code into google and there are images of other weddings where this dress features with and without petticoat. It cost £1,700 when purchased and it's been professionally dry-cleaned at a cost of £150. Collect in person or postage can be arranged the price will be sourced and confirmed at time of sale.